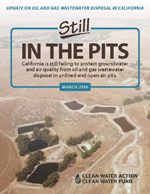 Clean Water Action has been the leading voice in calling for a prohibition on oil and gas wastewater disposal into open pits in California. Since 2014, we have published two reports that are the basis for our call to end this disposal method. The continued gaps in data and monitoring indicate that regulators are unable to ensure the protection of drinking and irrigation water. Regulatory oversight has increased - but it is still not enough. Statewide there are 1165 total pits, 790 of which are active. The vast majority (1113 total, 746 active) are in the Central Valley, primarily in Kern county. The Central Coast Regional Water Quality Control Board has now also identified 52 pits (44 of which are active), the majority of which are in Santa Barbara. We now know how many pits are not adequately regulated, by either not having a permit to operate or possessing a permit that is so old that it predates regional water policies. 60.1% (475) active pits, and 68.9% (803) of all pits, are inadequately permitted. These pits either do not have a permit, or have a permit that was issued prior to adoption of the local Basin Plan - 1975 for the Tulare Lake Basin and 1971 for the Central Coast. For an interactive map of pits in California, showing locations, activity and permit status, click here. Failure to shut down polluting facilities: State and regional agencies continue to fall short in regulating effectively and shutting down pits that are, or may be polluting vital aquifers. There are still hundreds of sites where operators discharge toxic wastewater, threatening groundwater and air quality, and are out of compliance with water quality laws and policies. 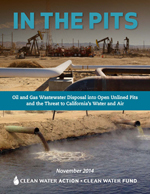 Our reports highlight evidence from three pit facilities that show impacts to groundwater in Kern County. All three continue to operate. The Racetrack Hills, Fee 34, and McKittrick 1 and 1-3 facilities all have been found to be sources of migration of wastewater into, or threatening to enter sources of drinking and irrigation water. Additionally, we conducted air sampling that found elevated levels of over a dozen harmful compounds at one facility, yet safeguards for air quality are minimal. Recommendations: Our latest report makes the case for our current recommendations to reduce, and ultimately end air and water pollution from open-pit disposal. We call for the state to implement an immediate prohibition on disposal into open pits, a recommendation supported by CCST, an independent and politically neutral scientific review panel. Enforce existing water quality laws and shut down pits that are polluting, will likely pollute high quality groundwater, or do not have up to date permits. Enforce SB 4 regulations more broadly and prohibit waste from wells that have been stimulated from being disposed of in pits. Require complete chemical transparency for all fluids used in oil and gas wells, and comprehensive chemical testing for all wastewater. Ensure that the wastewater reporting mandate established by SB 1281 is fully implemented. Maintain an accurate and up to date database of pits. Develop guidance for the Regional Water Boards on data collection and dissemination. 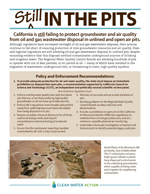 Include a prohibition on open pits in the California Air Resources Board's (ARB) new regulations on methane from oil and gas production, and at a minimum expedite planned air monitoring. Undertake a thorough investigation of inactive and historical pits to identify potential legacy pollution.